The interior of a slave pen in Alexandria, Virginia, shows the cells where people were held prior to being sold. A description of a slave pen, located half a mile from the Capitol in Washington, D.C.: "It is surrounded by a wooden paling fourteen or fifteen feet in height, with the posts outside to prevent escape and separated from the building by a space too narrow to admit of a free circulation of air. At a small window above, which was unglazed and exposed alike to the heat of summer and the cold of winter, so trying to the constitution, two or three sable faces appeared, looking out wistfully to while away the time and catch refreshing breeze; the weather being extremely hot. In this wretched hovel, all colors, except white-the only guilty one-both sexes, and all ages, are confined, exposed indiscriminately to all the contamination which may be expected in such society and under such seclusion." Edward S. Abdy, Journal of a Residence and Tour in the United States of North America, from April, 1833, to October, 1834 (London: J. Murray, 1835). The more powerful the the depiction, less powerful are the words that can convey an opinion. 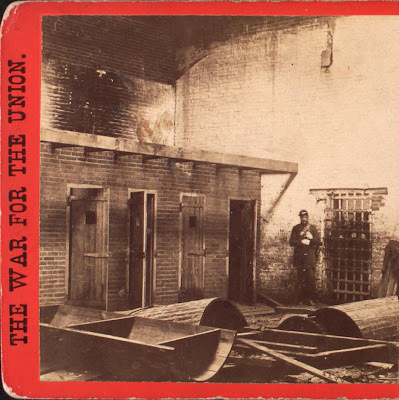 Did you know that the site the US Supreme Court in Washington, DC was once a slave jail that was also used to intern Confederate prisoners in the US Civil War? It had such a notorious reputation that it had to be completely demolished. What a trip.